Okay, so William Carlos Williams had this awesome inspiration from looking at the paintings of a Dutch painter named Brueghel. I was inspired by his poetry and by Brueghel at a recent exhibit at the Phoenix Art Museum, so I am posting the paintings along with the poems for your viewing and reading pleasure. An earlier work by Williams on Brueghel's "Adoration of the Kings" originally published in The Nation, May 31, 1958 and later used as part of "Paterson, Vol. 4"
Thank you to Lynda for bringing this one to my attention! an old man or a woman? This is a wonderful poem, just the sort of thing I am always looking for. I note that you do not always fully identify the works. 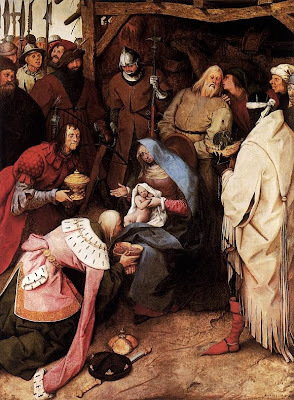 In fairness to your readers, you should be meticulous in this matter, especially because Pieter the Elder sired two generations of accomplished artists, Jan the Elder, Pieter the Younger and Jan's sons, Jan the Younger and Ambrosius.This "Adoration of the Kings" is by Pieter the Elder (1564) and is in the National Gallery, London. I fuss about these things because I teach art history.